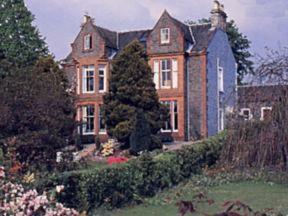 Choose from 40 hotels and guest houses in Dumfries-and-Galloway. Shown below a just a selection of the hotels available. To search within an area please use the menu on the right. The Manor Country House Hotel - In beautiful private grounds, only 4 miles (6.5 km) from Dumfries and 8 miles (13 km) from Lockerbie, this charming 200-year-old country house hotel offers satellite TV and free Wi-Fi. 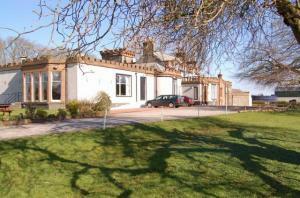 On the A709 Lockerbie Road, the Manor Country House Hotel has good access to the region's major road network. The hotel is close to both the A75 Stranraer link road (2 miles/3.2 km) and the main M74 main North/South Motorway (8 miles/13 km). The beautiful beaches of the Solway Coast are only a 25-minute drive away. Free on-site parking is available. The en suite rooms have Sky satellite TV and boast charming little extras, such as bottled water and shortbread. The hotel offers a choice of restaurant or bar food, with daily specials and a children's menu. Family-run by your hosts, Caroline and Ken, the hotel has just 7 rooms and is a great choice when looking for a smaller, more intimate hotel. Dalston House Hotel - The Dalston House Hotel is a comfortable and warm hotel to spend an enjoyable stay in. Ten minutes from town centre This family run quality establishment is pleasantly situated on the edge of the town centre, with its 14 en suite bedrooms, a lounge bar and a restaurant. It is within easy walking distance to the ice bowl, swimming pool, and museum with it's camera obscura Dumfries - a picturesque market town - the ideal base for exploring Dumfries and Galloway, the Solway Coast, or day trips to Glasgow, Edinburgh, Ayr or venture south to Carlisle and the Lake District. This hotel is a smoking hotel and there are no non-smoking rooms available. Cross Keys Hotel - Built in the 17th century, this hotel is one of the oldest coaching inns in Scotland and is ideally placed for exploring the Scottish borders. Cross Keys Hotel is located in the centre of Canonbie, Scotland, which nestles within the valley of the Border Esk River. Canonbie is just off the A7, Carlisle to Edinburgh trunk road, making for an ideal stopover. The cosy Cross Keys Hotel is personally looked after by Brian and Yvonne MacAskill and their small team of friendly staff. It has a reputation for great cuisine. Our head chef has compiled a menu that should satisfy all tastes and fancies. From quick and easy pub meals through to continental ? la carte, you can be sure that you will find something to tickle the taste buds. Fresh local produce and seasonal specialities are always available. 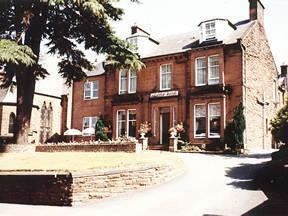 Solway Lodge Hotel - This family-run hotel in the centre of Gretna offers a warm welcome in homely surroundings. It is near to Gretna Register Office, Anvil Hall and the famous blacksmith's shop. 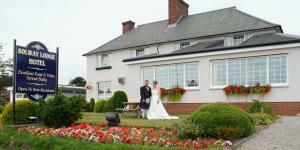 Solway Lodge Hotel is ideal for weddings, receptions, conferences and getaways and is 5 minutes from the motorway. Use the hotel as a base for touring Dumfries and Galloway, and for walking, cycling and visiting the stunning coast or Galloway Forest Park. The Urr Valley Hotel - The Urr Valley Hotel is a long established country house hotel set in 12 acres of mature woodland and gardens. With its stunning views across the Dumfries and Galloway countryside, it is in an ideal location. Within walking distance of Castle Douglas, one of the region's most attractive towns, the hotel makes an ideal base for touring the attractions of Dumfries and Galloway. Built around 1700, the Ernespie House, as it was known, has a long and interesting history. Standing in 12 acres of grounds with interesting historical features, the Urr Valley now offers a quiet and peaceful setting for your stay in the Galloway countryside. Edenbank Hotel - Edenbank Hotel is a completely non-smoking, family-run hotel on the outskirts of Dumfries, only a 5-minute walk from the town centre. There are en suite rooms, a restaurant and a function room hosting live music most weekends. Please state if you would prefer a quieter room (subject to availability). The Pheasant Hotel - This family-run hotel offers attractive en suite accommodation in the centre of Dalbeattie, on Scotland's beautiful Solway coast in Kirkcudbrightshire. In the heart of attractive countryside, some 12 miles (20 km) west of Dumfries, the hotel has 8 well-equipped en suite bedrooms. Each room has tea/coffee making facilities and TVs. All of the rooms are comfortably furnished with high-quality bedding. A generous and tasty traditional cooked Scottish breakfast is included in the price. Drinks and snacks are available in Wilburs Bar. Wilburs Restaurant offers high quality food and great value for money. Free Wi-Fi wireless internet access is available throughout the hotel. Best Western Station Hotel - The Station Hotel is a beautiful Victorian building, facing the railway station and only a few minutes walk from the town centre and local night life. The Gables - A beautiful, turn-of-the-century Grade II listed property, situated in the heart of Gretna with gardens laid to lawn, floral borders and shady trees. The hotel is ideally located for exploring Dumfries and Galloway with its forests and lochs, or historic Carlisle and the northern lakes. Designer shopping at the Gretna Gateway is just 5 minutes away, and if horse racing is your sport, Carlisle Race Course is a short drive away. Golf, fishing, horse riding, clay pigeon shooting and quad biking are amongst the many activities available. Premier Inn Lockerbie (Annandale Water) - Offering comfortable, good value accommodation, Premier Inn Lockerbie (Annandale Water) has excellent access to the local bus service, providing the ideal base from which to explore the surrounding area. 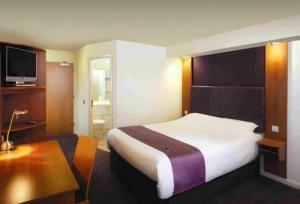 Some of the comfortable rooms at Premier Inn can accommodate 2 adults and 2 children (under 16 years). 1 child is also served a free full breakfast, when accompanied by an adult eating a full breakfast. The full breakfast includes cooked items, vegetarian options and a wide continental selection. Premier Inn Lockerbie (Annandale Water) is next to a Road Chef Costa, serving dinner or snacks in a welcoming environment. There is free on-site parking and a 24-hour reception at this Premier Inn. Bruce Hotel - The Bruce Hotel, situated in Newton Stewart in the heart of beautiful Galloway, is a quality 20 bedroom 3-star hotel that offers good service, good food and good prices. It prides itself on its warm and welcoming atmosphere and friendliness. All rooms are en suite with full facilities including Wi-Fi internet and drink making facilities. The restaurant has a strong reputation for its extensive menu using local produce. All dishes are home cooked and freshly made. Access to most outdoor pursuits and activities is possible at reduced rates. Kings Arms Hotel - The Kings Arms Hotel is one of the oldest establishments in Lockerbie, dating from the 17th Century. From 26th March 2006 The Kings Arms became a non-smoking building in line with new Scottish Law Bonnie Prince Charlie stayed here in 1745 and Sir Walter Scott in 1813. The hotel has catered for weary travellers since the times when horse drawn coaches would pass through the wide passageway to the stable beyond (the undercover parking area today). The original beamed buildings and tack room are now the comfortable Lounge Bar and Buccaneer Restaurant, where today's guests can enjoy tasty Bar meals beside blazing log fires or choose from our Table d'hote and a La Carte menus. The Stag Hotel - Hidden away amid the natural wonders in the valley of the Moffat Hills, this is the ideal getaway whether you're a walker, golfer, visitor, cyclist, fisherman or simply passing through. 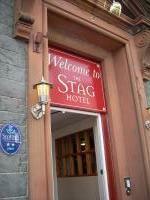 At The Stag Hotel, a warm welcome awaits you! There are 6 comfortable en suite rooms, each with extra fluffy towels, indulgent toiletries and speciality teas. Excellent home cooking is complemented by the hotel's friendly local staff, who will greet you and ensure that your stay is a most memorable one! 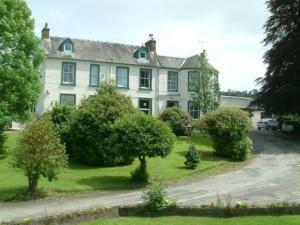 Well View Hotel - Family Run High Quality Hotel Excellent award winning cuisine and wine list. 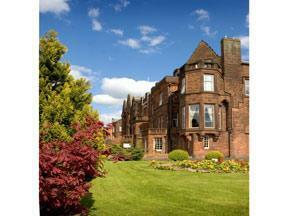 Well View Hotel is a Mid Victorian villa which has been tastefully converted into a top quality small hotel. Furnished and equiped to the highest standards all rooms are individual. Auchen Castle Hotel - In 35 acres of magnificent formal gardens and woodland, this luxurious 4-star country house hotel offers elegance, comfort and fantastic food in Dumfries and Galloway, the gateway to Scotland. In the beautiful Scottish Borders, with breathtaking views over the Moffat Hills, Auchen Castle is the former home of Sir William Younger. Today, this beautifully preserved castle still retains many of its original period features. There are 25 rooms, 15 of which are feature bedrooms situated within the original castle. Elegant, luxurious and romantic, some of the castle rooms have four-poster beds. There are also 10 lodge rooms in a separate modern annexe. These large, family-size rooms have fabulous views over the castle's beautiful grounds. All of the rooms are individually styled and appointed. With fabulous panoramic views of the Upper Annandale Mountains and the lake, the award-winning Le C?page restaurant offers fine dining. The superb cuisine is freshly prepared and made, whenever possible, with high-quality local produce. 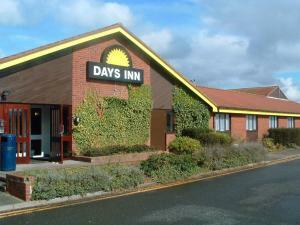 Days Inn Hotel Gretna Green - Days Inn Gretna Green is close to the M74 and M6 motorways, and within easy reach of Carlisle. Newcastle-upon-Tyne and County Durham are about 1 hour from the hotel. The famous wedding village of Gretna Green is close by. Tasteful en suite rooms, free parking and personal service make this convenient hotel an ideal place to break your journey. Each bedroom has a TV (with Freeview channels), a free hot drinks tray and newspaper, a hairdryer and a trouser press. All rooms have broadband Wi-Fi at an additional cost. Pets are permitted in the hotel. Please inform the hotel when you make your booking. 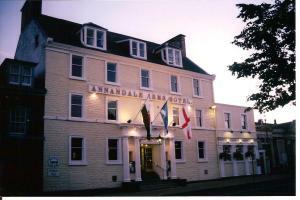 Annandale Arms Hotel - Only a minute off the motorway (M74), the Annandale Arms Hotel offers you a truly warm Scottish welcome. 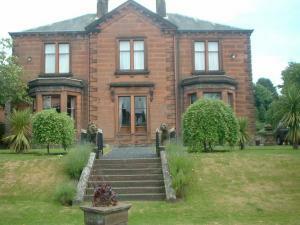 Set in the centre of the attractive and popular village of Moffat, you can enjoy the tranquility. We have a first class restaurant serving the best of local produce, from Buccleuch Estates beef to organic lamb from Glen Ken. Our salmon, trout and scallops are as good as Scotland gets. The cellar boasts some 100 bins with a selection of 50 malt whiskies. The hotel's convenient position in the centre of the village, but with its close proximity to the countryside, makes it a perfect base to explore the hills and glens of historic southern Scotland. The imposing Georgian fa?ade encapsulates all that is best in traditional Scottish hospitality. This has been recognised formally by the award of the Les Routiers Gold Key 2001 for 'hotels who achieve a level of excellence above and beyond that of merely 'very good''. If you wish to visit Edinburgh or Glasgow, they are both only one hour away by car. Smiths At Gretna Green Hotel - All bedrooms have king or super king-sized beds, contemporary fireplaces, broadband and a great deal more. Located right next to the world famous Old Blacksmith's Shop, you too can become part of an unbroken thread of romantic history spanning over 250 years. The new, exciting Smiths at Gretna Green embraces both tradition and modern day comforts with inspirational design, set against a historical backdrop. Enjoy a blend of professional, relaxed hospitality, along with 1st class facilities. The Market Inn Hotel - Stylishly decorated, tastefully furnished and renovated to a high standard, the Market Inn Hotel is situated in the heart of Castle Douglas, famous for its impressive cuisine. 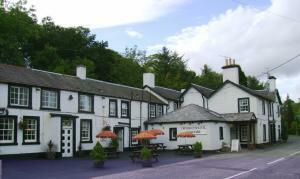 Stylish and contemporary throughout, the hotel nevertheless maintains a traditional Scottish atmosphere. The lounge bar and the larger function room are both cosy and inviting, ideal places to either relax or enjoy the entertainment that is frequently laid on. There are 9 comfortable en suite rooms, each decorated in a modern style. The manned reception desk is always open to assist you with any requirements. 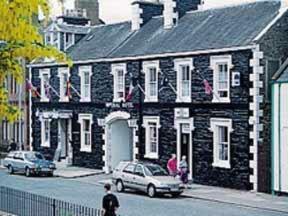 The hotel is conveniently located just seconds away from King Street, the main shopping street in Castle Douglas. King Street has a wide range of shops, including many traditional shops. Surrounded by the unspoilt natural beauty of the Galloway countryside, Castle Douglas makes a great base from which to explore the beauty of Southern Scotland. The Imperial Hotel - This friendly hotel is situated in the centre of Castle Douglas, with a location ideal for fishing, walking, cycling, golfing and relaxation. 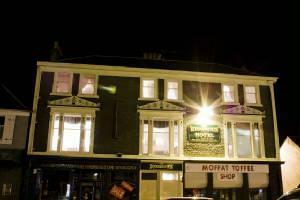 The Imperial Hotel offers 3 bars, a private car park, a pool room with dart boards, and good Scottish home-cooking using local produce. It is well-located for playing golf on one of the 30 courses in the area. All rooms are en suite and have tea/coffee facilities, satellite TV and central heating. The Kings Arms Hotel - Surrounded by the unspoilt natural beauty of the Galloway countryside, this charming former coaching inn is a great base from which to explore the beauty of Southern Scotland. The Kings Arms Hotel has a long tradition of hospitality and has been offering food and refreshments to weary travellers and guests for over 200 years. Today, the hotel offers comfortable en suite accommodation. All of the rooms have a TV, tea/coffee making facilities, radio alarm clocks and telephones. The hotel's Courtyard Restaurant overlooks the ancient vine and the beautiful magnolia tree. The restaurant enjoys an enviable reputation for the quality of its food, which takes full advantage of fresh local produce, including Galloway beef and Solway salmon. The Kings Arms is the leading golf hotel in the area and the landlord is happy to offer help and advice on the golfing facilities available in the region. Bonnington - Opened in November 2008, this small, family-run hotel is situated on Moffat's High Street and is recently refurbished, with newly carpeted and furnished rooms. Close to the A74 (M), one of the main routes from England to Scotland, the Bonnington Hotel is great for a stopover on the way north or south or for a longer stay. Close to Gretna, Moffat is lovely, charming little town. A great place for walking; it was the first town in Scotland to become a "Walkers are Welcome" town. All of the rooms have a TV and tea/coffee making facilities. A full cooked English breakfast is served in the attractive dining room, which looks out over Moffat's High Street. Evening meals are also available, with the excellent menu including daily-changing specials. The Bonnington Hotel is family run and your hosts Paul and Violet, pride themselves on offering a warm welcome and comfortable accommodation at great-value prices. Cavens - Winner of 'Scottish Small Hotel of the Year 2008', this luxury hotel is set in 6 acres of parkland, one mile from the Solway with its sandy bays and coastal walks. Cavens is all about understated style and luxury. All 7 bedrooms have en suite bathrooms, and some have private sitting rooms. Cuisine awarded an AA Rosette is served with style, with daily-changing menus featuring local organic produce cooked with passion and flair. Relax in the vast sitting rooms with open fires for drinks before and after dinner. The hotel is personally run by its resident owner. 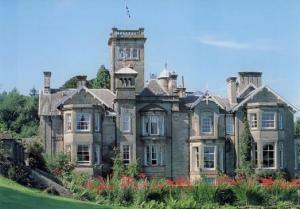 Gretna Hall Hotel - Set in 12 acres of landscaped grounds, Gretna Hall was built in 1710. 1 Mile from the English border, the original Manor has been extended to provide comfortable accommodation. The hotel has retained an historic feel helped by the Blacksmith's Courtyard, where even now hundreds still flock to be married. All through the summer months you can expect to see horse-drawn carriages and champagne corks popping as bridal parties stroll through the exquisitely kept gardens. Less than a mile is the English Border. The Lake District is a pleasant day trip where excursions by cruise boat and steam train can be arranged by the hotel. The Scottish Borders' country towns of Jedburgh and Melrose are also close by, with Edinburgh, under an hour by train, making it a surprisingly convenient sightseeing and shopping trip. Creebridge House Hotel - The Creebridge House Hotel is a traditional Scottish country house hotel which preserves the peace and tranquility of rural life in elegant surroundings. Your hosts Stephen, Sarah & Rory Donnan and staff look forward to offering you a warm welcome and comfortable stay. The hotel acquired it's name from the River Cree and is situated in three acres of idyllic gardens and woodland at the foot of the Kirroughtree forest. The hotels location makes it central to a wide variety of activities. From walking and cycling through the nearby forest parks to golf and fishing so close you can walk to the nearest hotspots. In fact the first tee at Newton Stewart Golf Club is just 400 yards away. The busy market town of Newton Stewart is a mere two minutes walk and roughly 30 minutes drive to the port town of Stranraer with ferry links to Belfast. Premier Inn Dumfries - With a convenient location, Premier Inn Dumfries is 3.2km from Dumfries town centre and railway station, perfect for exploring Dumfries and the beautiful surrounding area. Some of the comfortable rooms at Premier Inn can accommodate 2 adults and 2 children (under 16 years). The 2 children are also served a free full breakfast, when accompanied by an adult eating a full breakfast. The full all-you-can-eat breakfast includes cooked items, vegetarian options and a wide continental selection. Premier Inn Dumfries is next to the Solway Gate Table Table restaurant, providing good food, served in a welcoming environment. There is free parking and a 24-hour reception at this Premier Inn. Cairndale Hotel And Leisure Club - Right in the very heart of Dumfries, this popular hotel is close to all local amenities including the fabulous new DGone leisure venue, the Odeon cinema and the Theatre Royal. The hotel offers 91 en suite rooms and suites, free car parking, free Wi-Fi wireless internet access, 3 restaurants/cafes and excellent leisure facilities. Fine dining and an ? la carte dinner menu is available in Reivers Restaurant every night, and all-day service is available until 22:00 in the Forum Cafe Bar. The hotel also hosts regular weekend entertainment throughout the year, including a pianist in the Reivers Restaurant (on selected dates), as well as dinner dances, ceilidhs and cabaret nights with fantastic tribute acts. The hotel boasts 6 meeting rooms, which can accommodate up to 300 delegates and the excellent leisure facilities include a 14-metre indoor swimming pool. Best Western Dryfesdale Country House Hotel - Situated in beautiful Annandale, just a short distance from Gretna Green, part of Dumfries and Galloway in south-west Scotland, the hotel is set amid 5 acres of scenic, elevated parkland and approached through an avenue of Beech trees - a minute off the A74M junction 17. The Dryfesdale House holds one of the most enviable positions and affords some of the most beautiful views in the whole of Dumfries and Galloway. Steeped in history, the hotel dates back to 1762, but with all the up-to-the-minute amenities you would expect from a top-class hotel. Moreig Hotel - Perfect Hotel accommodation in Dumfries & Galloway, furnished to a high standard, the Moreig Hotel is close to the centre of Dumfries in South West Scotland. Good food and comfortable accommodation, the Hotel is ideally situated for the visitor to explore the historic Dumfries area and the surrounding countryside. Dumfries has much to offer the visitor, including golf on a number of high quality courses, from championship links to parkland courses, also fishing, pony trekking and walks.